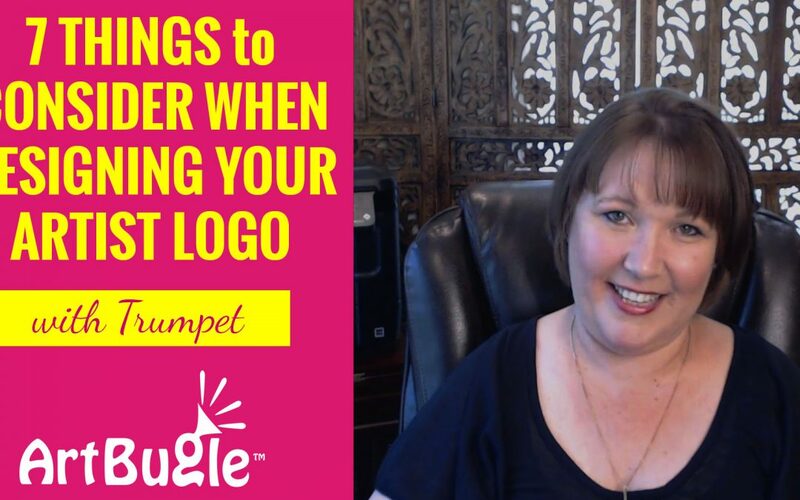 In my video on Six Reasons You Need a Logo for Your Art Business, I explain why it’s important to create a logo for your art brand. Now, I want to discuss with you some critical things you need to take into account when creating your artist logo! Your logo needs to not only look good, but it also needs to be flexible so that it can be used in various circumstances that you need to consider when you are designing your logo, whether you are designing it yourself OR you are outsourcing to a graphic designer. So I’ve put together a short list of best practices to help guide you through the very important process of creating a logo. Keep it Simple. Less is More with a logo. Your logo needs to be easily recognizable at all sizes. IF you use your logo superimposed on a piece of your artwork, this may look good at one size, but as you run into different instances where you use your logo, often the message becomes unreadable and you’ve really lost it’s purpose. So keep it simple. Words with some sort of design or symbol works best. Use text that is clear and readable. Your logo is not a piece of art. Art typically contains lots of detail … your logo should not! You want something simple that a viewer’s brain can quickly digest and associate with your business. Make sure your logo is scalable. Have you ever seen and image that has been enlarged and looks blurry? Or the edges are jagged and not clean? That’s because someone has enlarged an image that is not in VECTOR format. Vector images are scalable and can be resized without losing line quality. For your logo you need a good vectorized form of your logo so you can using in ALL scenarios without issue of losing quality. Raster images are images like photographs or scans of your artwork. Consider how and where your logo will be used. For artists, this is typically on business cards, on your website, on postcards, in exhibit materials and other marketing materials. Your logo will also likely be used to watermark any low-resolution images that you share on the web. Considering how and where your logo will be used, will help you also determine colors and orientation. I often recommend coming up with a logo, but have variations of it for different purposes and places. For example, you may want a white version of the logo for use as a watermark or for placement on dark backgrounds. Then you may want you default to include some bright and cheery colors. Also, you may want a version of your logo that fits nicely into square space, as you may want to use the logo as profile images in your social media channels. Make sure your logo is unique. Don’t copy someone else’s’ logo. First off, it’s illegal as you would be engaging in copyright infringement and second, you don’t want any likelihood of confusion. I also don’t recommend using clip art in your logo. By doing so, you risk having a logo that is the same as the next guys AND you have no grounds for claiming legal rights to your own logo. So as much as you can, make your logo unique. You want to stand out in a very crowded space! One way to do this is by using a unique symbol in your logo. Something simple but identifiable. You are an artist! One idea may be to draw a symbol that means something to you and then have that symbol scanned and vectorized. The cost to vectorize a line drawing is not that great. You can use a service such as Fiverr.com and get that done for as little as $5. If you have tips or suggestions based on your own experience with creating an art brand logo, please share them with me in the comments. I love hearing from you.